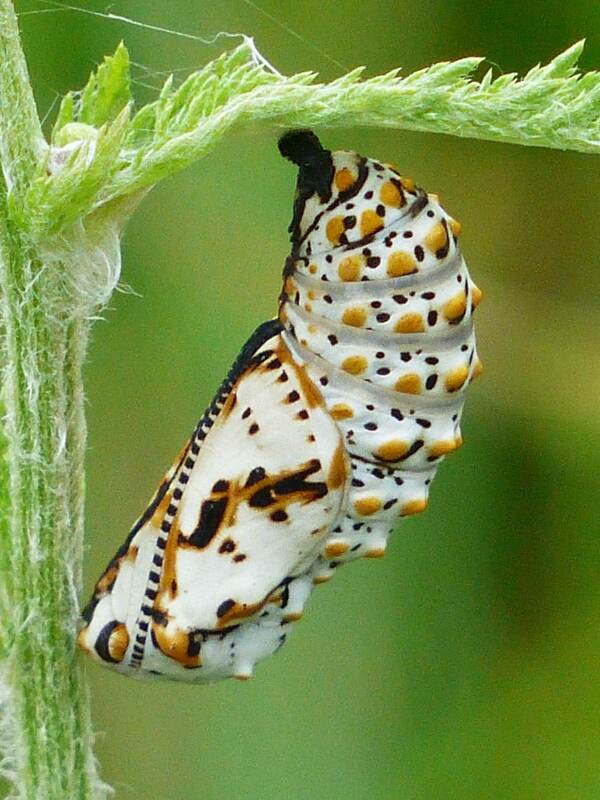 Comments: This small but colorful butterfly can be seen all summer and into the fall. 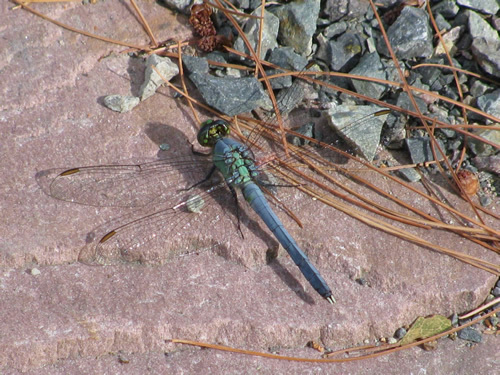 Comments: This individual was chasing another to mate. 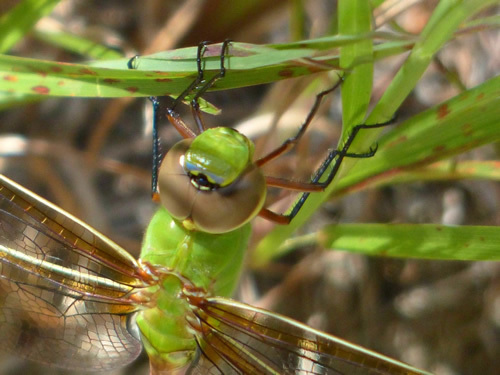 is a stunning sight when viewed up close. 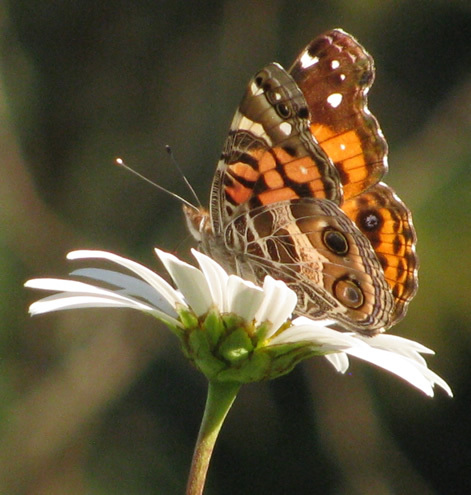 Comments: This American Lady butterfly was feeding on Nippon daisies blooming in our garden. 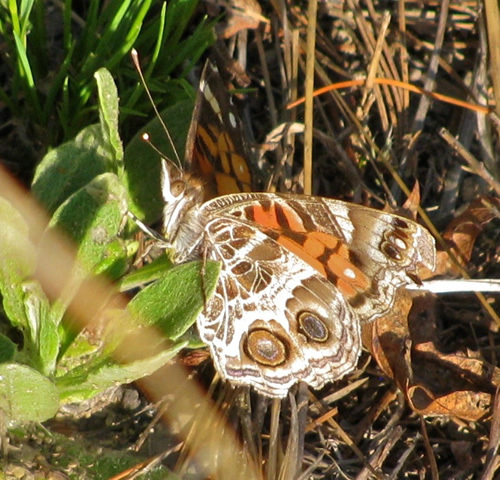 There was also a Painted Lady butterfly, which looks very similar, but has four small spots on the undersides of its trailing wings instead of the American Lady’s two large ones. 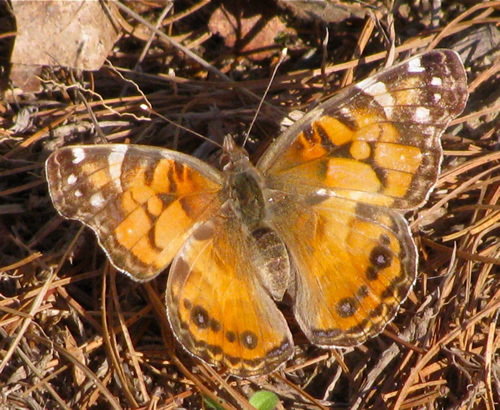 Comments: American lady butterflies (V. virginiensis) have two large eyespots on the underside of the hind wing, whereas similar-looking painted lady butterflies (V. cardui) have four small eyespots. 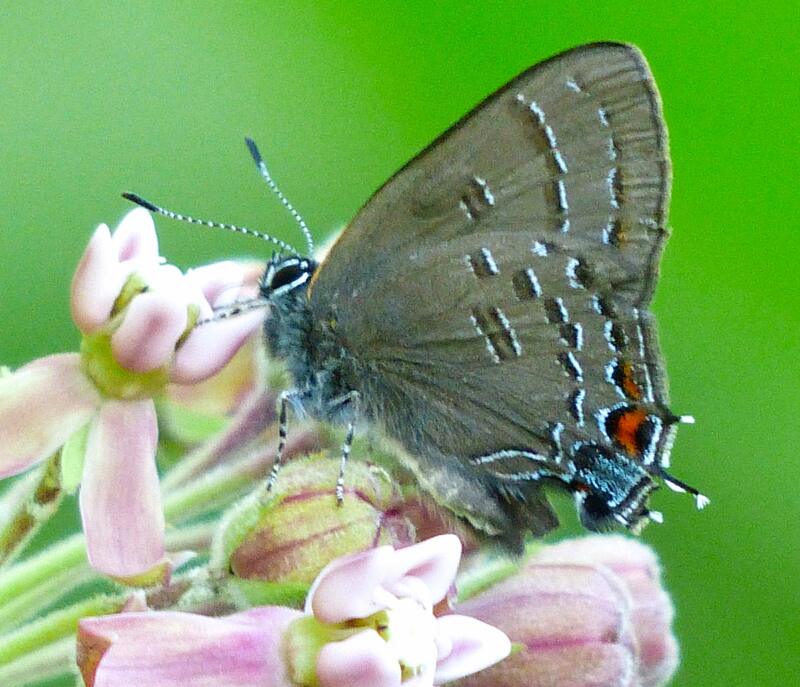 This individual was feeding on a flowering shrub. 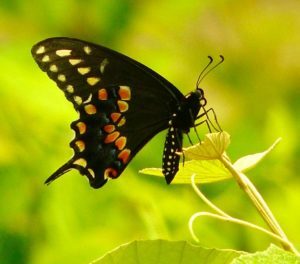 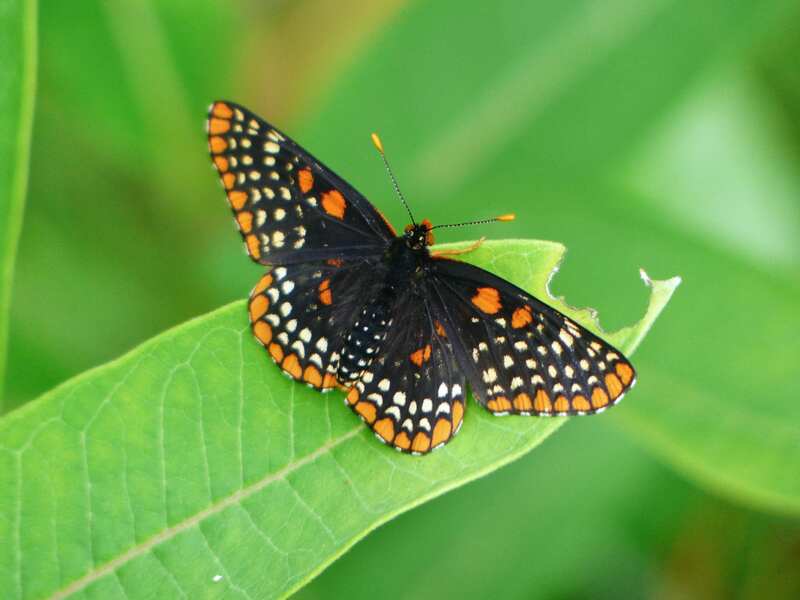 More Information: See Butterflies and Moths of North America. 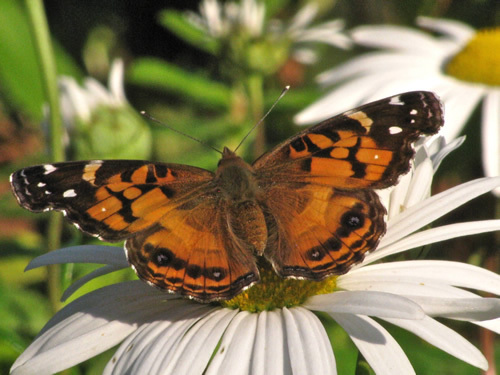 Comments: American Lady butterflies have two distinctive eyespots on the brown underside of the lower wings. 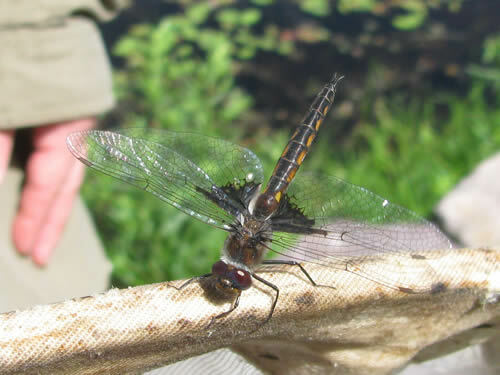 The upper sides of the wings are orange and black. 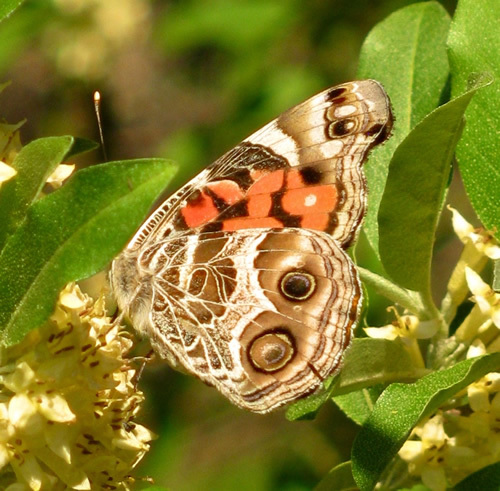 Comments: American Lady butterflies look a lot like Painted Lady butterflies. 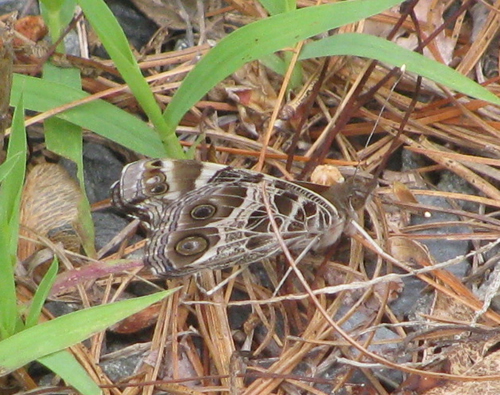 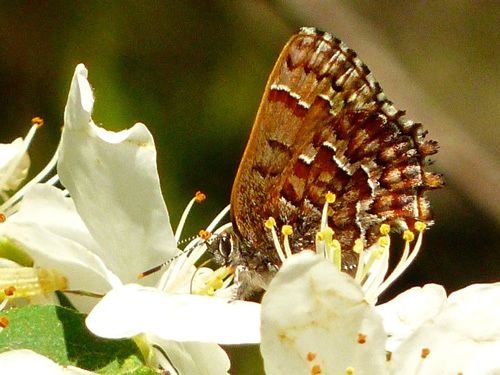 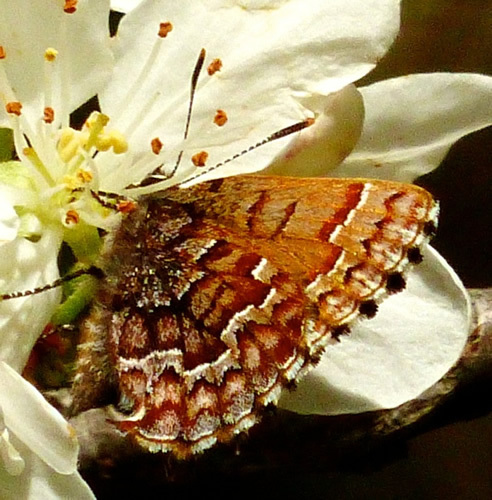 The American Lady has two large spots on the undersides of its trailing wings. 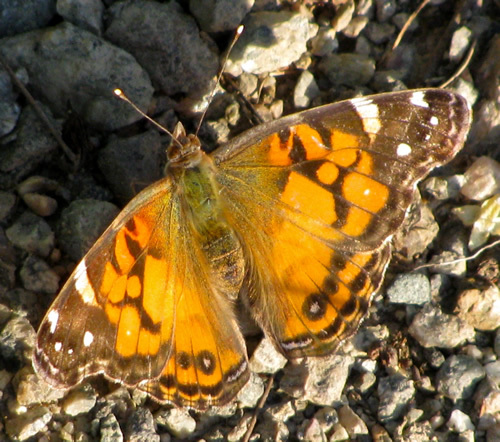 The Painted Lady has four smaller spots instead. 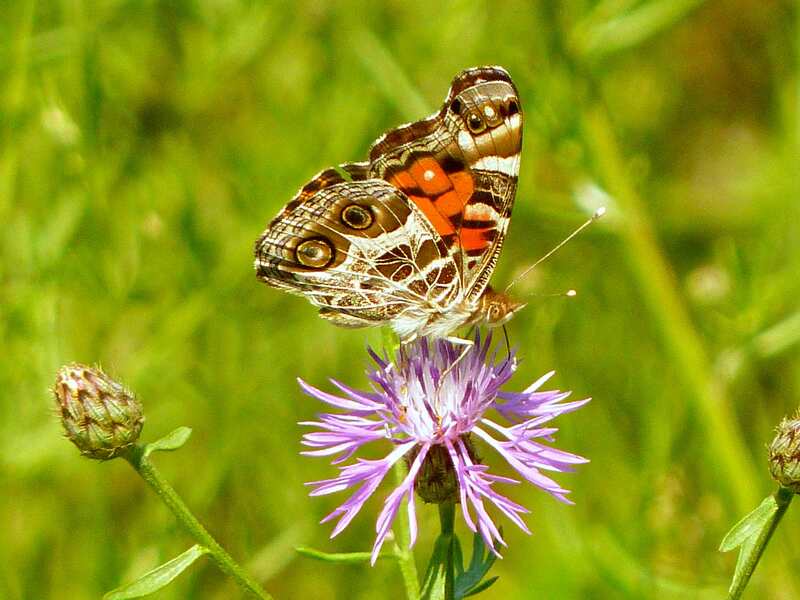 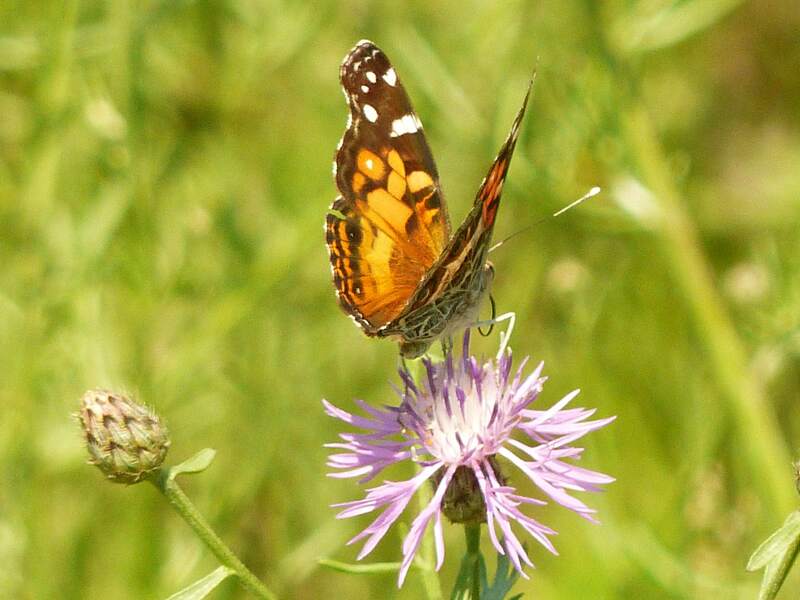 This Amerian Lady was feeding on a spotted knapweed blossom. Comments: This field experienced a population explosion of Baltimore Checkerspot butterflies. 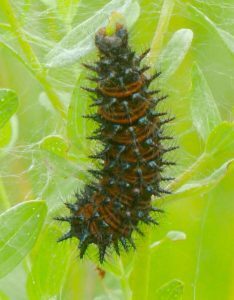 All phases could be found at the same time: eggs, caterpillars, chrysalises and adults. 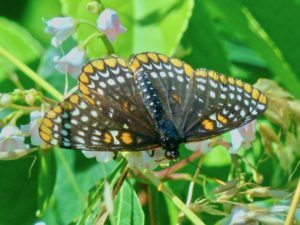 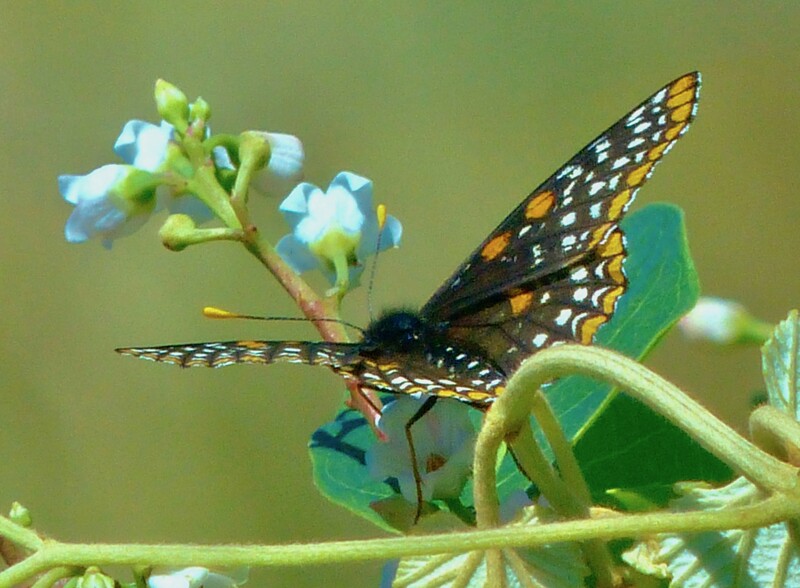 Comments: I saw just one Baltimore checkerspot among other butterfly species feeding on dogbane blossoms. 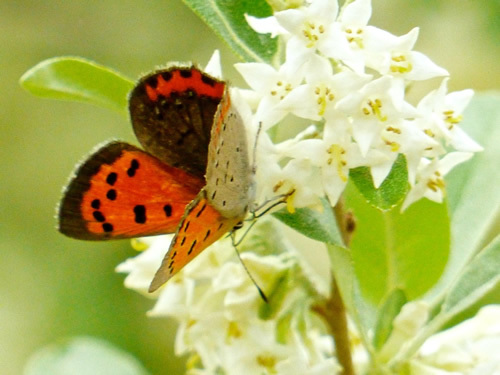 Comments: This small butterfly was feeding on milkweed blossoms. 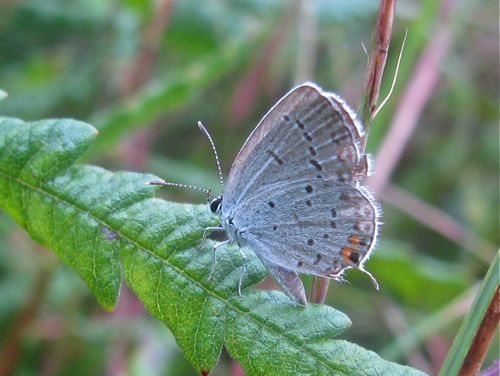 Banded hairstreaks are very similar to striped hairstreaks. 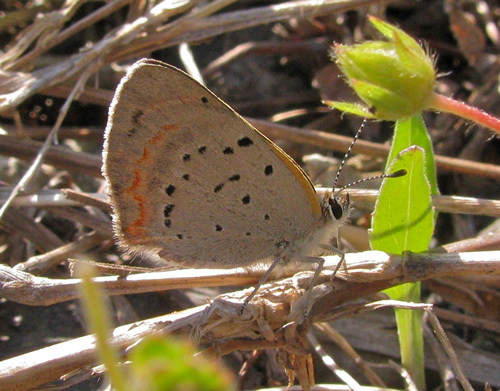 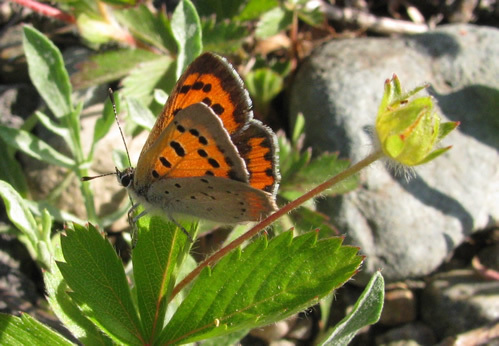 The blue marginal spot on the hind wing is capped with orange in the striped hairstreak but not in the banded hairstreak. 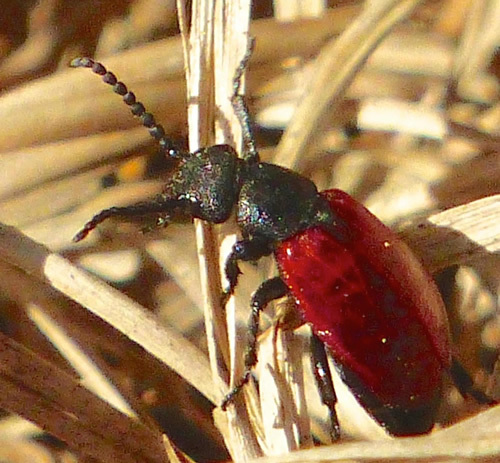 Comments: This colorful beetle is found throughout the eastern U.S. Its bright color and contrast warn predators that they taste bad if eaten. Observation Location: Moose Hill in the meadow at the end of the “unnatural trail”. 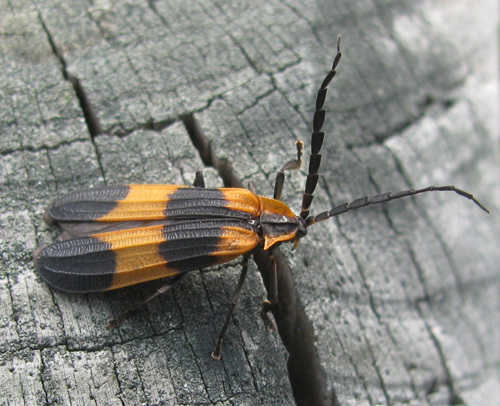 Comments: Blister beetles receive their common name from the ability of their hemolymph to produce blistering on contact with human skin. 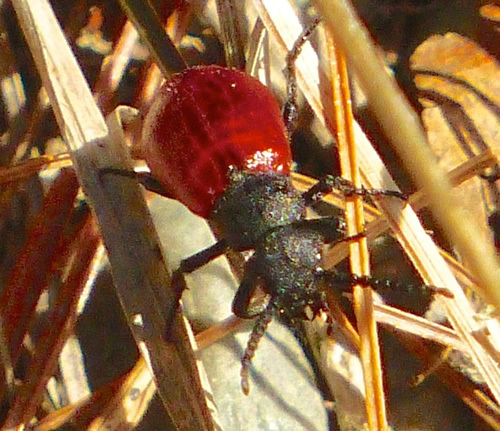 Hemolymph is often exuded copiously by reflexive bleeding when an adult beetle is pressed or rubbed. Blisters commonly occur on the neck and arms, as the result of exposure to adult beetles attracted to outdoor lights at night. 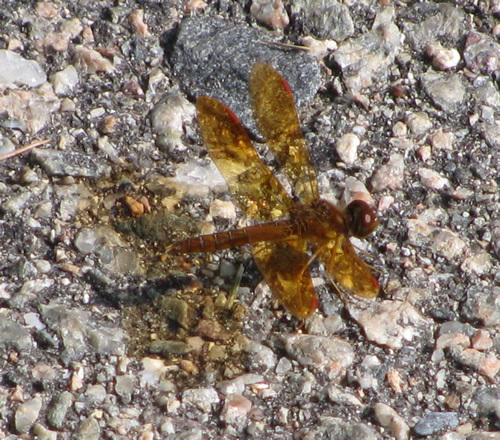 Comments: Female is brown with red eyes and yellow markings. 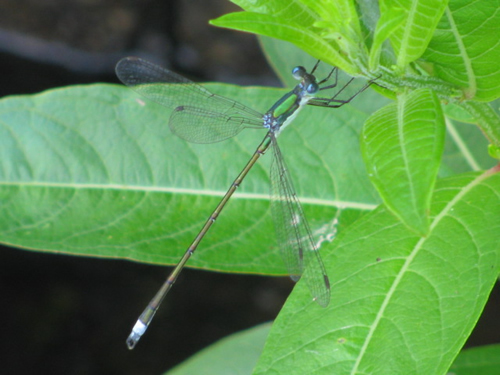 Male is blue with green eyes. 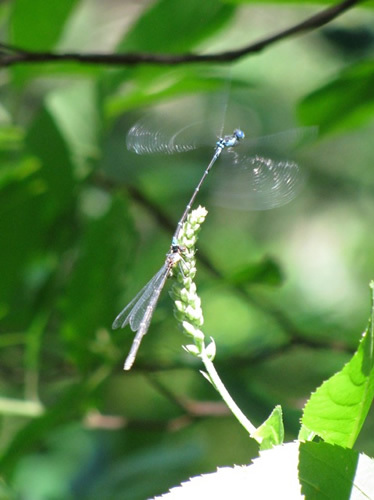 Comments: The male has a blue abdomen, hence the name. 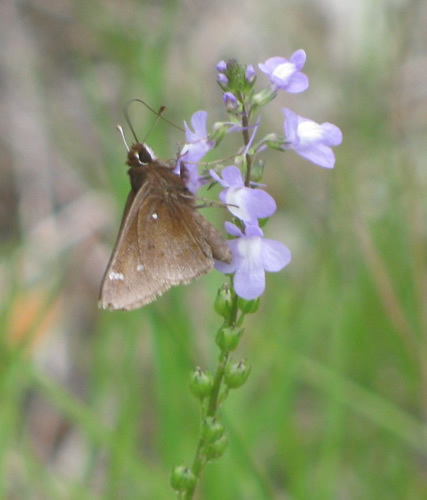 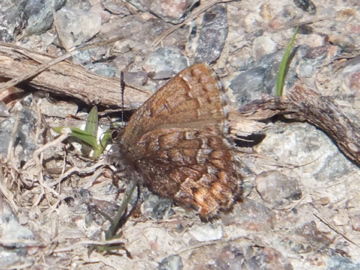 Comments: This brown elfin was found in the same meadow of wild indigo as a rare frosted elfin butterfly. 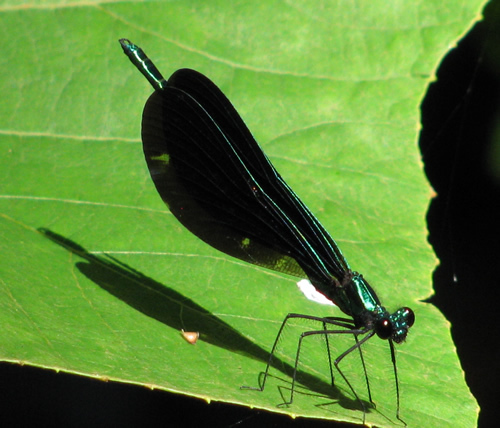 Observation Location: On one of the reflectors I have around my driveway. 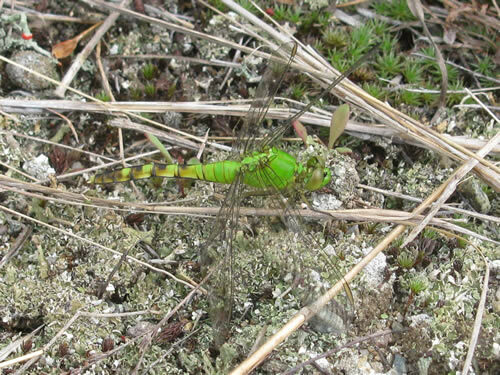 Comments: I first thought it was a praying mantis but none of the pictures showed one that small, or with the wasp-like abdomen. 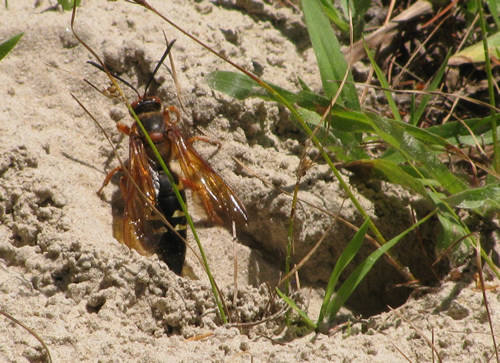 I decided to see if it was a type of wasp and voila! 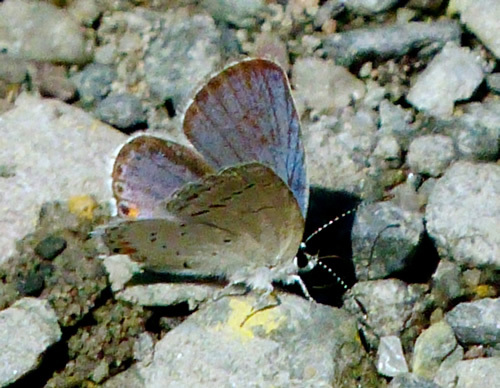 See this photo. 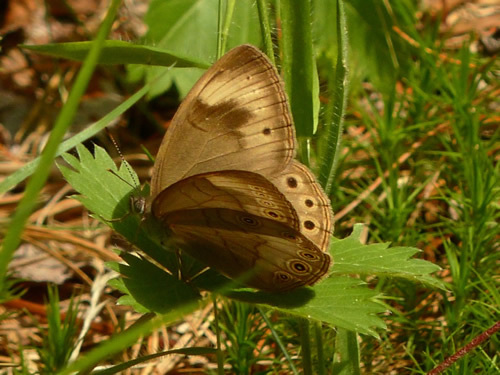 Comments: The moth flies from May to September depending on the location. 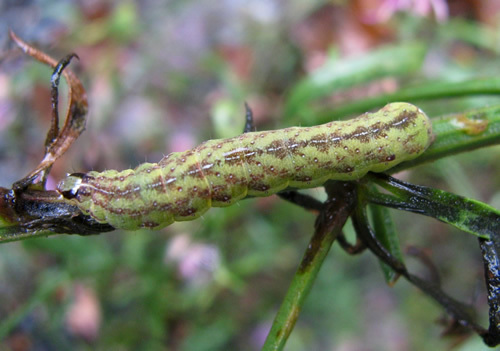 The caterpillars feed on Aster, Solidago and Callistephus chinensis. 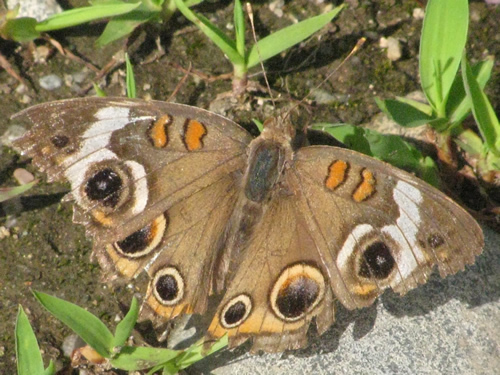 Comments: This bedraggled specimen is showing a lot of wear and tear on its wings. 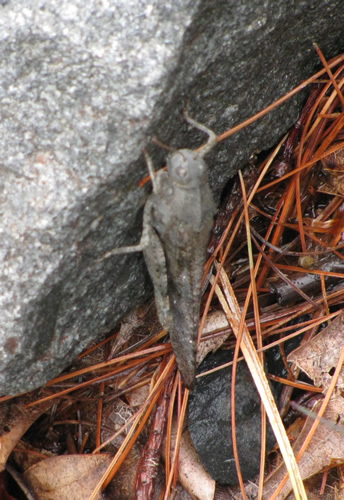 Comments: Caddisfly larva are aquatic. 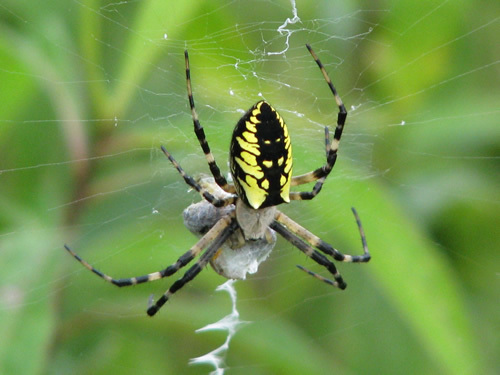 They build a protective case of silk around themselves, incorporating debris for camouflage and protection. 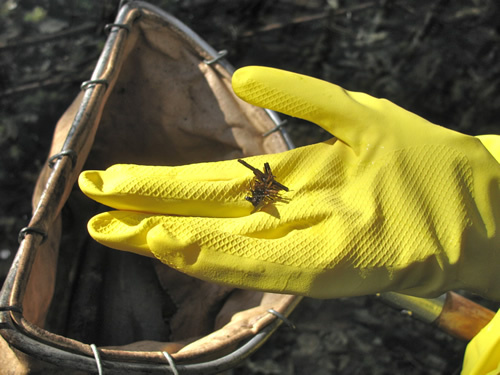 Their presence is indicative of good water quality. 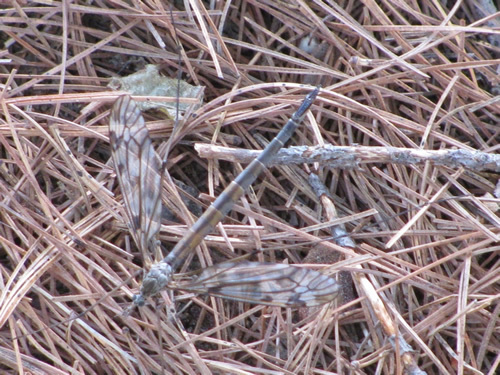 Adult caddis flies emerge en masse for just a few weeks. 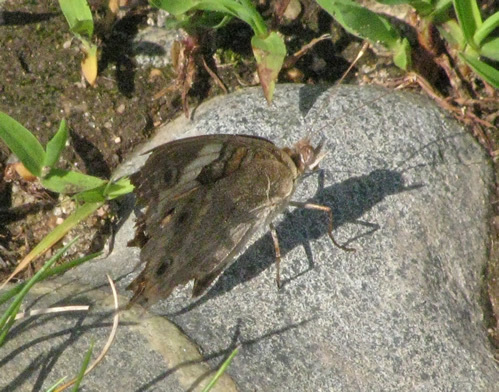 After emergence, they do not eat, but they mate and the females lay eggs. 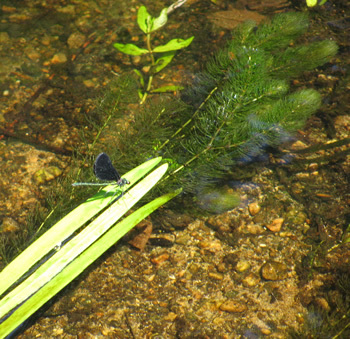 Caddisflies are a preferred food of trout. 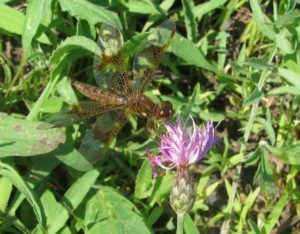 Comments: Canada darner dragonflies are very common in Massachusetts in late summer near sluggish marsh-bordered streams. 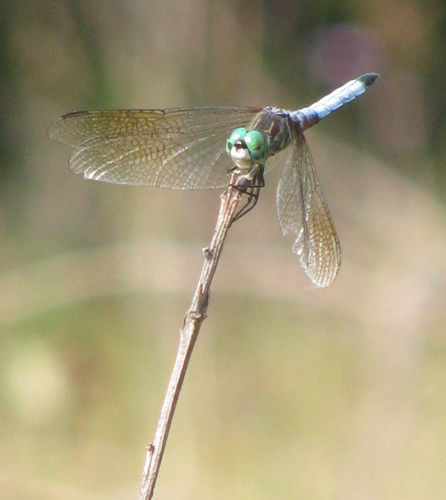 They typically hang vertically at rest. 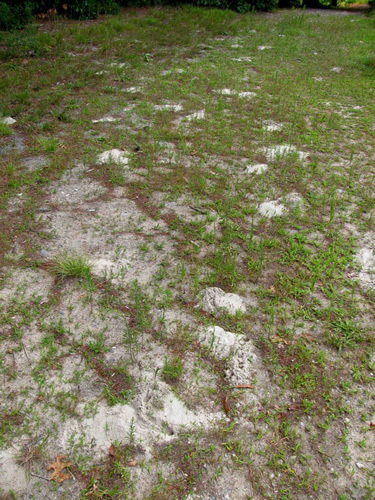 Comments: Diagnostic pronotum ridge is clearly visible in the photo. 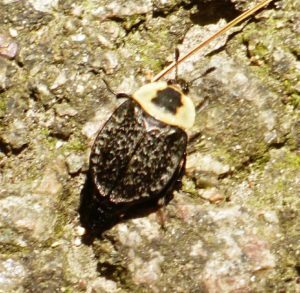 Comments: From spring through fall, during daylight, a few hours after flies begin arriving at a carcass, the adult beetles will arrive as well. 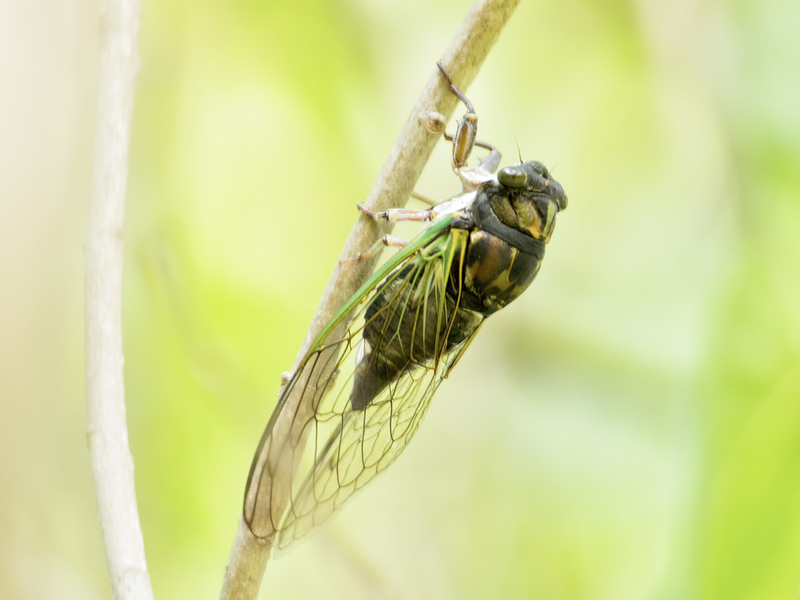 They immediately begin eating the already hatching fly larvae, mating, and laying their own eggs. 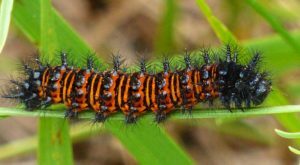 As long as the carcass lasts, the adults will remain eating competitors to give their own larvae a chance to eat and grow. Upon hatching from the eggs, the larvae will eat both the carcass and other larvae that are within it. 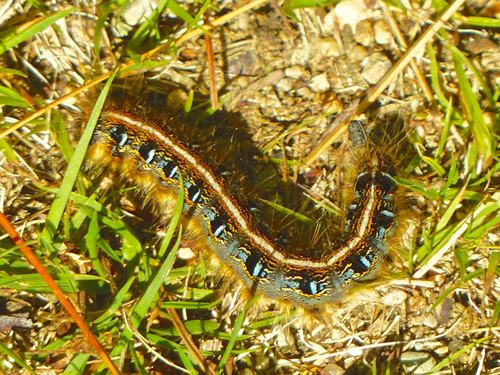 Eventually the larvae will fall to the ground, dig into the dirt, and pupate. 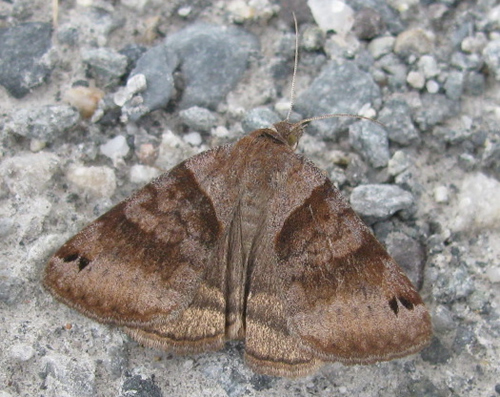 Overwintering is done by adults. 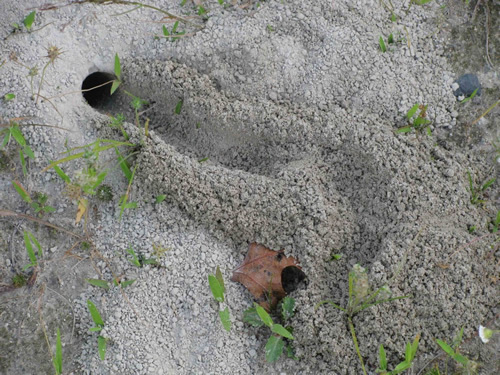 Comments: These large, fearsome-looking wasps burrow in the ground. 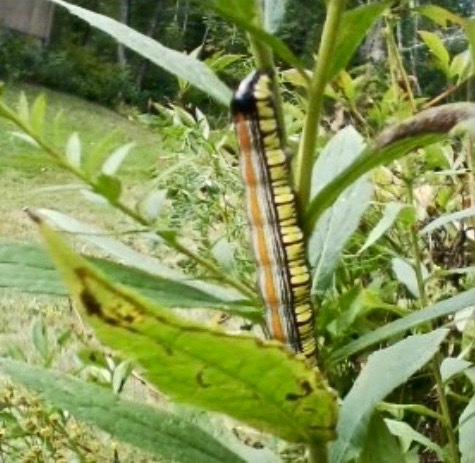 They are actually not aggressive. 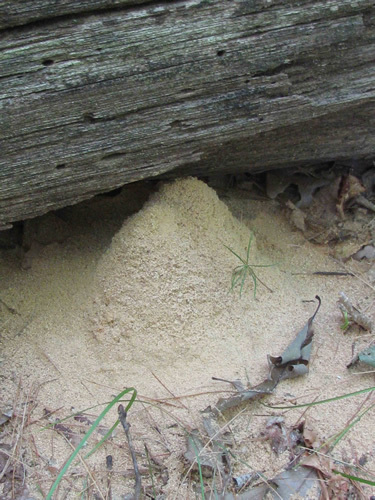 I found a sandy area near the Gavins Pond Dam that was peppered with their holes. 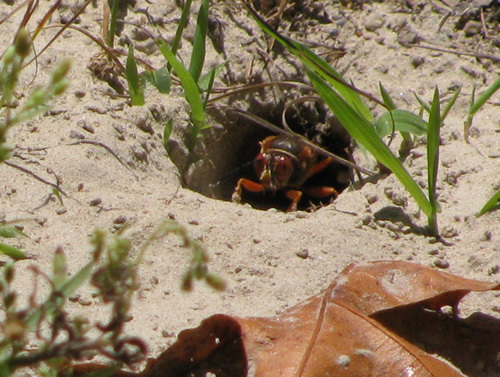 It took a while to figure out that these holes were made by the wasps. 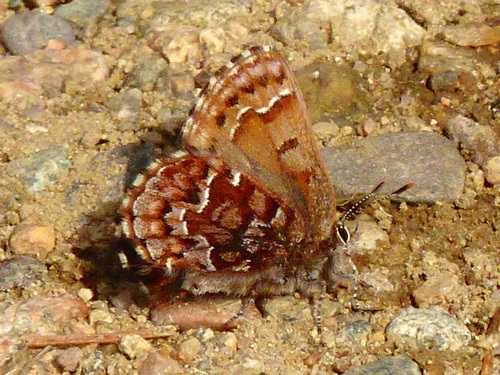 Comments: This butterfly was hard to photograph because it would not hold still! 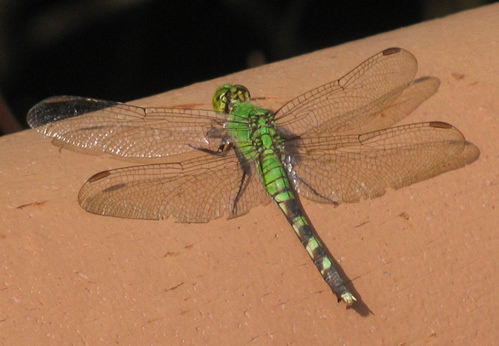 Note the big green eyes and the spots on the wing. 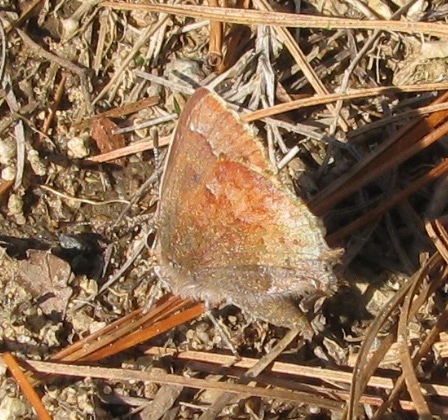 Comments: This moth stopped to rest on the soccer field parking lot, allowing me to get close enough for this shot. 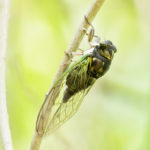 I got the ID from bugguide.net. 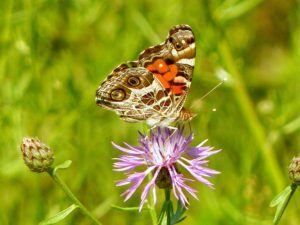 Comments: There are over 10,000 species of moths in North America. 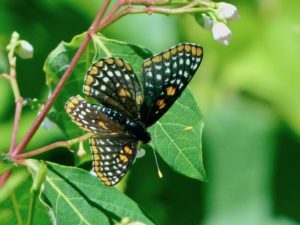 Identifying them can be a challenge, but there are some good online resources such as the Bug Guide. 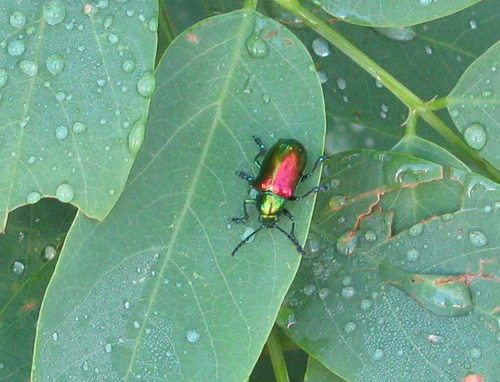 Comments: These striking beetles were eating eggplant leaves. 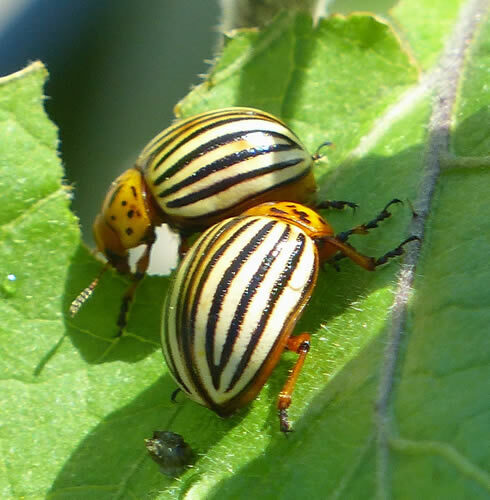 Colorado potato beetles have developed resistance to all known classes of pesticides. 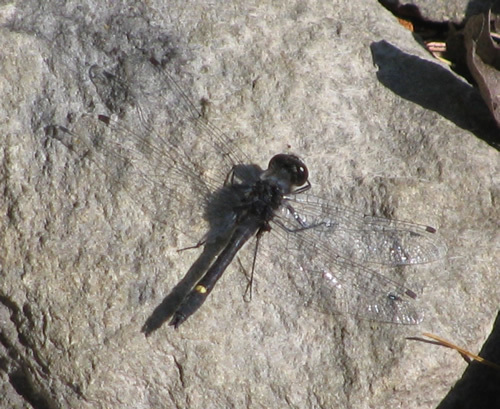 Comments: This is the most common baskettail within its range (eastern North America), hence the name. 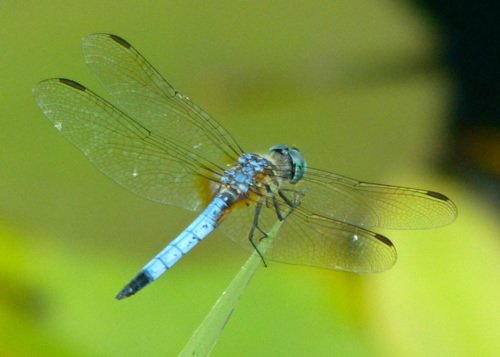 Comments: Pondhawk dragonflies are voracious hunters, but they are completely harmless to humans. 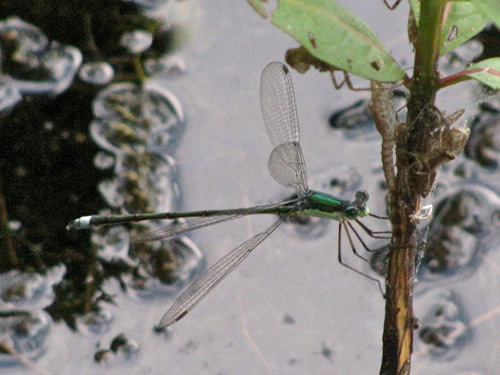 Females are green. 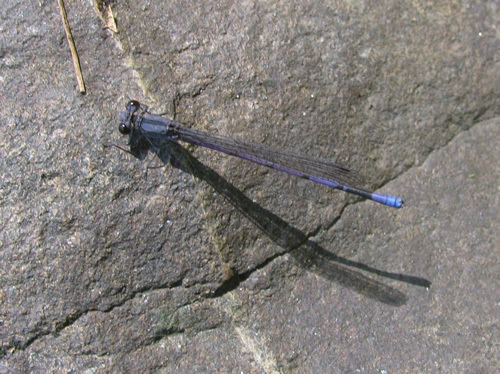 Males are blue. 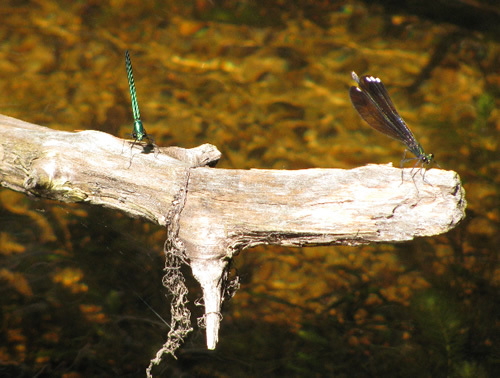 Females oviposit in flight, hovering low over the water and repeatedly dipping their abdomens into the water to release the eggs. 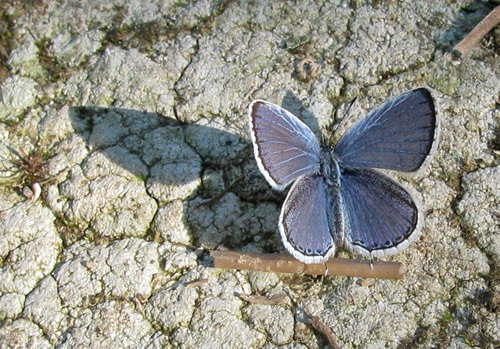 Comments: Males are blue. 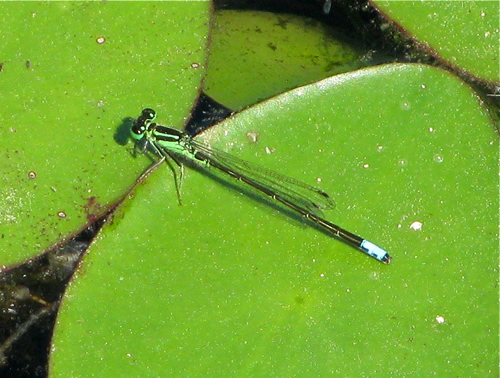 Females are bright green. 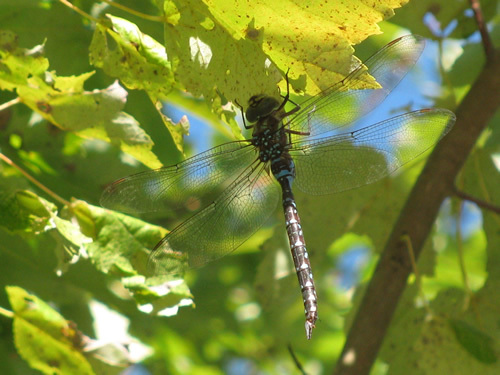 Voracious hunter near vegetated ponds and slow streams, but they are completely harmless to humans. 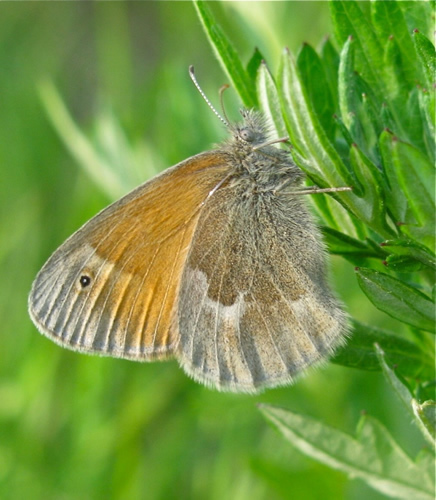 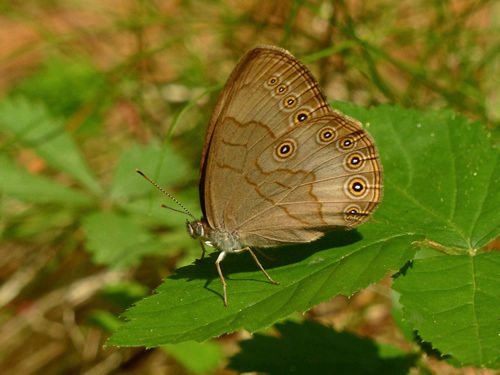 Comments: Ringlets can be found in a variety of grassy habitats, including roadsides, woodland edges and clearings, prairies, bogs, and arctic and alpine taiga and tundra. 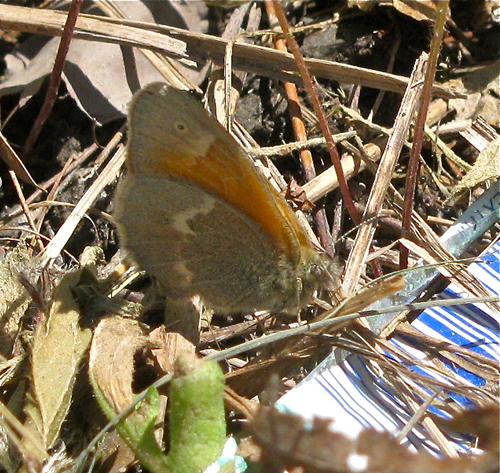 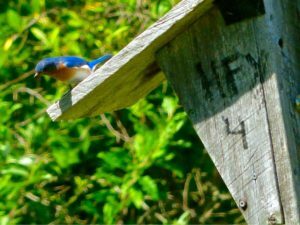 It is a poor flyer, but can sometimes be found along ditches seeking new grounds. 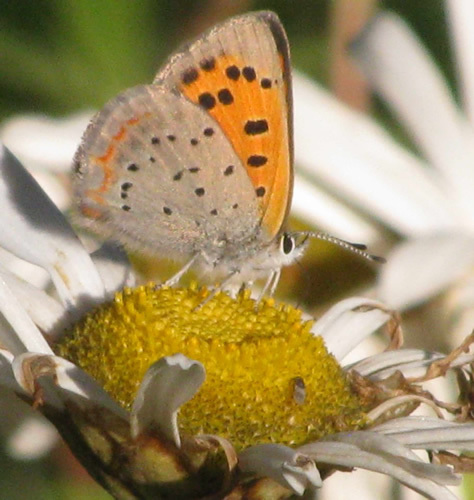 It is a holarctic species found in northern Europe and Asia and across North America. 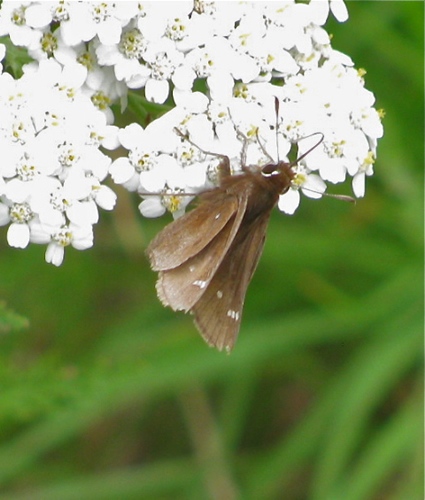 Comments: Although the word “common” appears in its name, I have only seen this small but striking moth twice in Sharon. 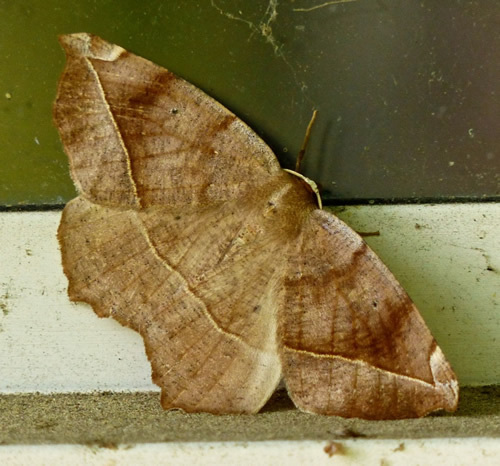 Comments: There are over 10,000 species of moths in North America. 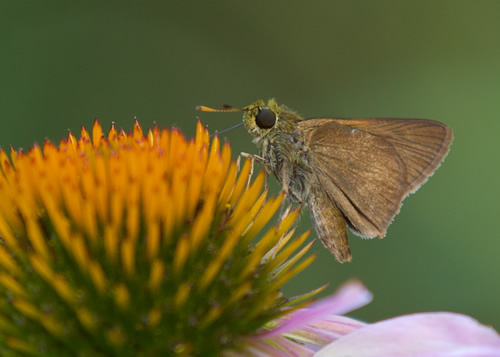 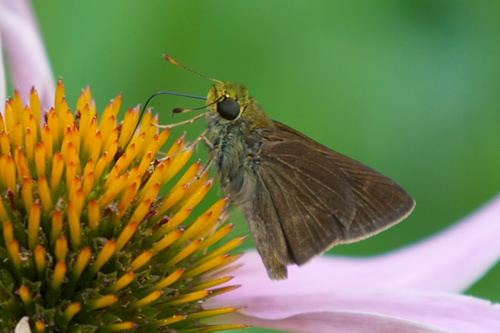 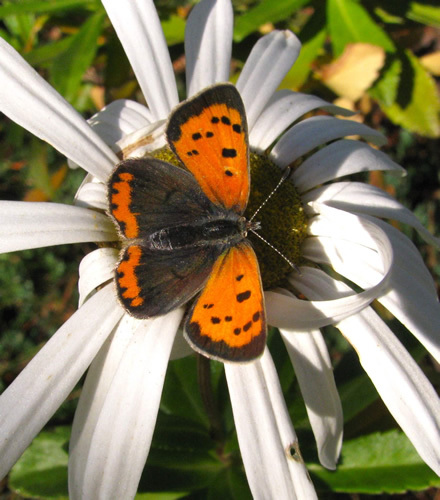 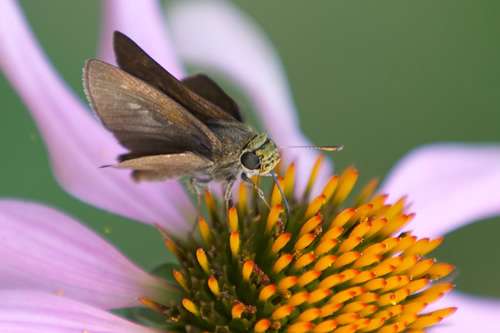 Identifying them can be a challenge, but there are some good online resources such as the BugGuide where you can get expert assistance for free. Comments: These insects look scary but they don’t bite. 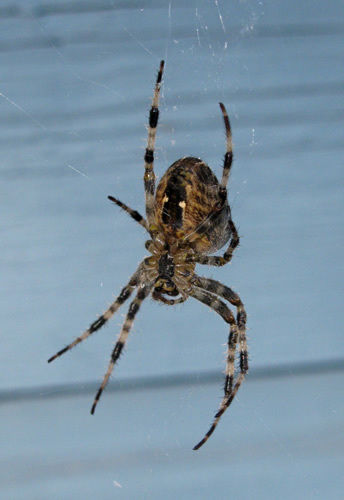 Comments: This common spider made a web right outside our garage door. 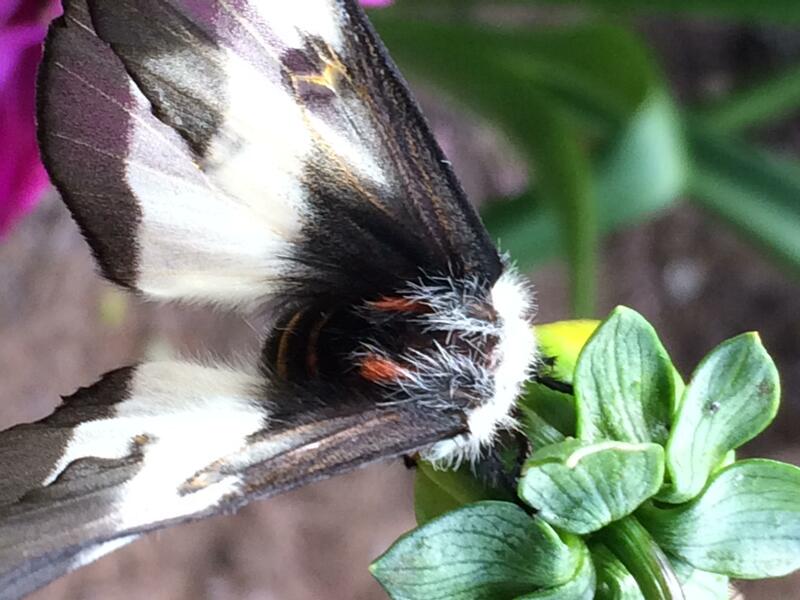 Comments: This big moth was perched on my windowsill. 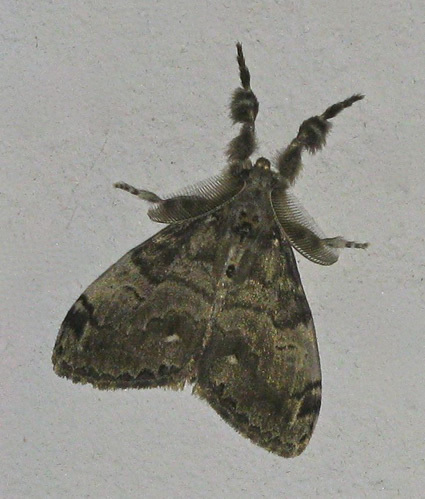 Comments: This big moth got into the house. 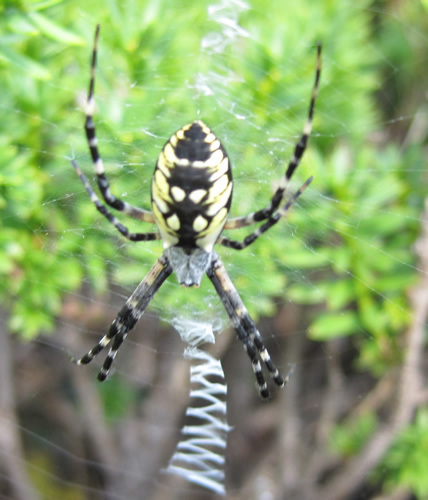 Observation Location: Power line cut along Moose Hill St. 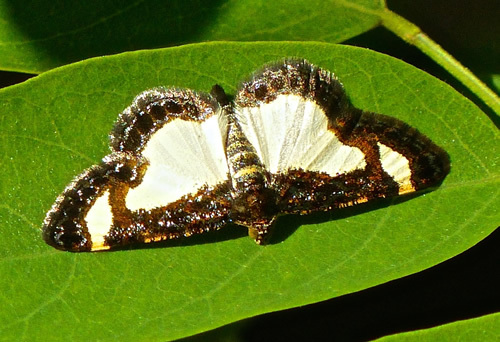 Comments: This one is teneral (wings are shiny), meaning that it recently emerged into adult form. 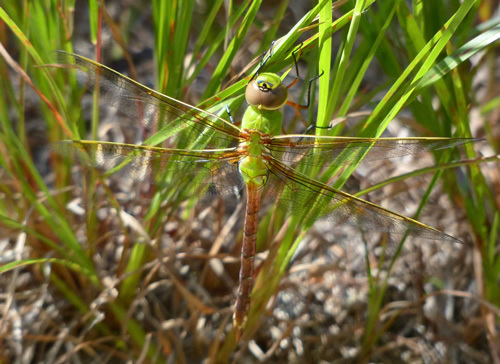 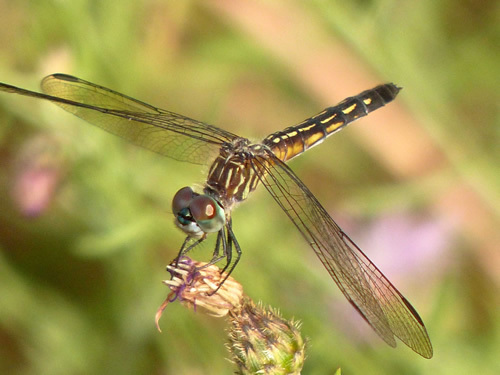 This dragonfly gets its name from the delta-shaped (i.e.triangular) marks along its abdomen. 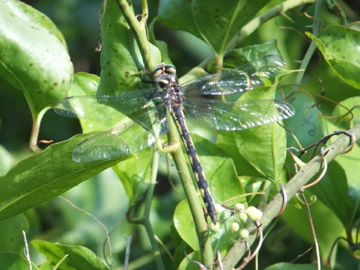 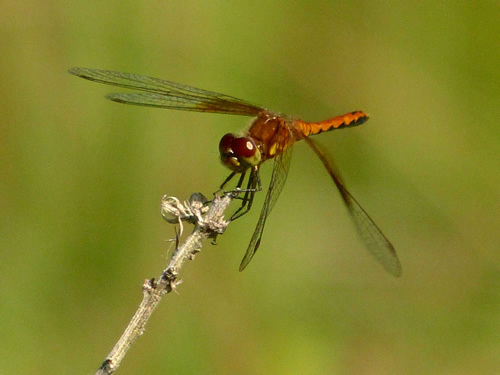 Comments: Among dragonflies commonly seen at Leach Pond in Borderland State Park. Comments: This fly looks like a drone honeybee—hence the name. 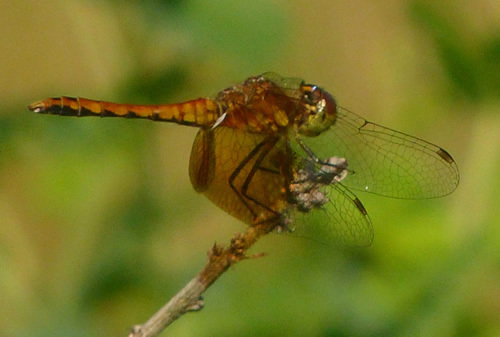 Comments: The wings of the male are entirely amber, whereas the wings of the female are clear with amber blotches. 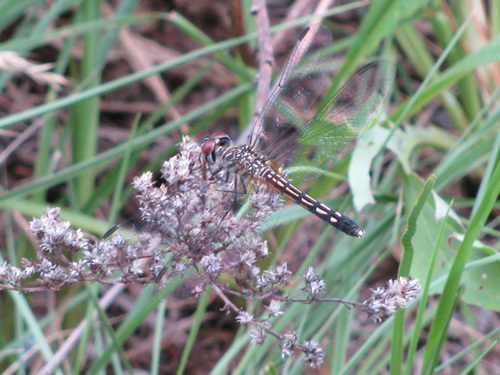 Comments: This red-winged dragonfly is smaller than most other dragonflies. 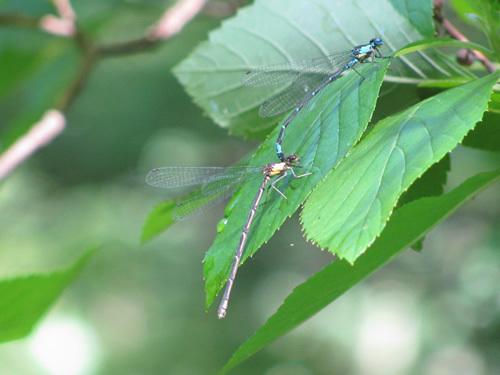 Comments: Males perch on tops of pine trees in the sun to find receptive females. 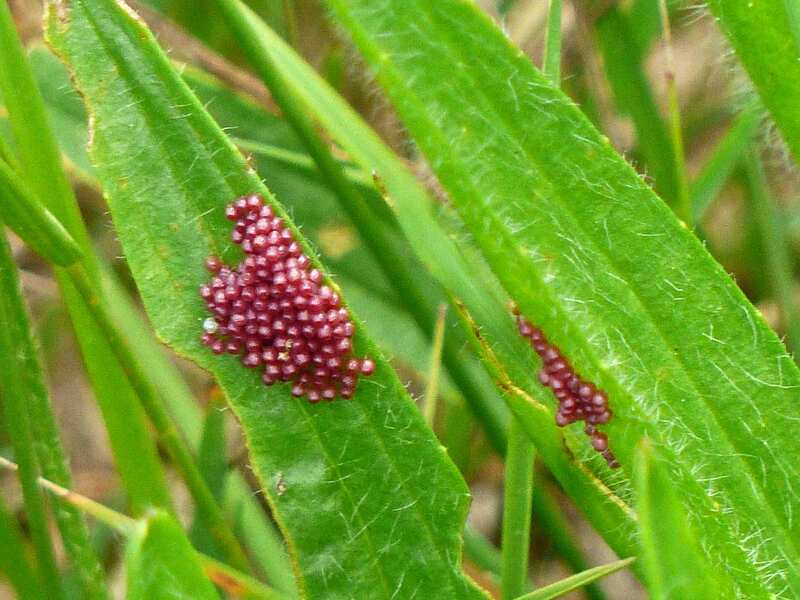 Eggs are laid singly on new needles of young trees; caterpillars feed on the needles. 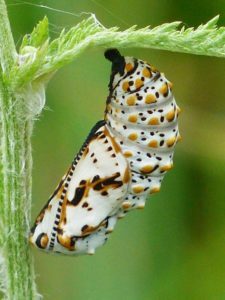 Chrysalids hibernate and adults emerge in the spring. 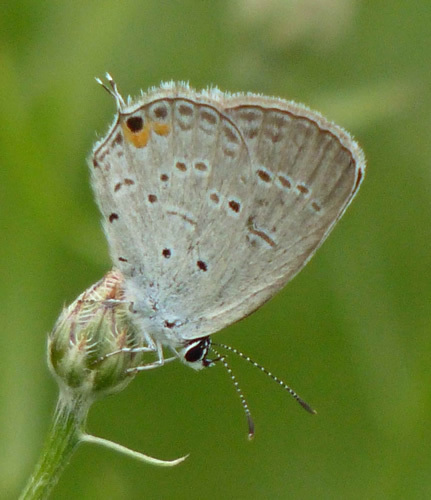 Comments: Eastern tailed blues are very small butterflies. 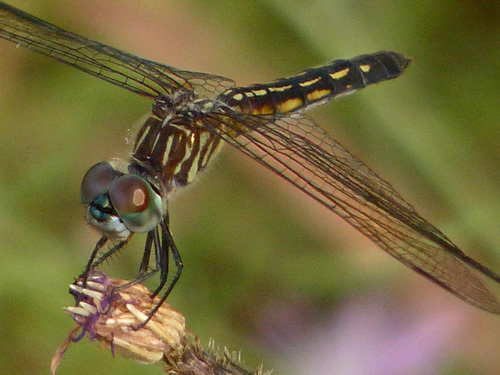 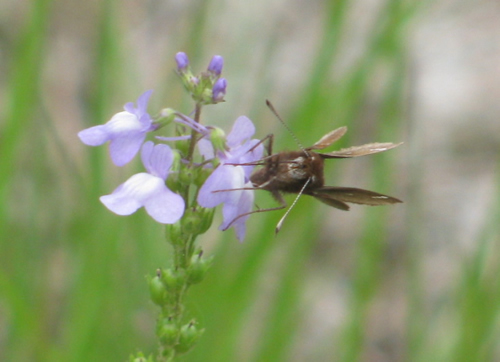 They have tails and an eye spot on each wing that vaguely resemble antennae and eyes to fool predators. 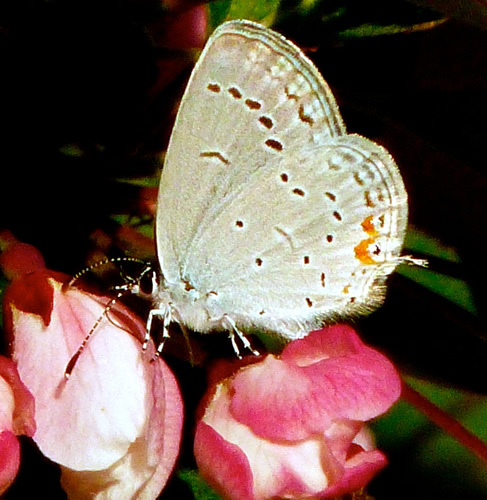 Comments: Like many small butterflies, the Eastern tailed blue is a stunning sight when viewed up close. 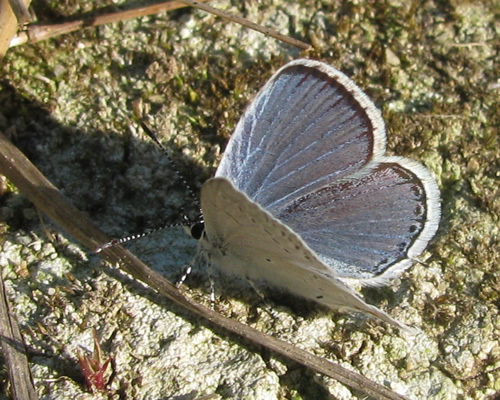 The upper sides of the wings are blue. 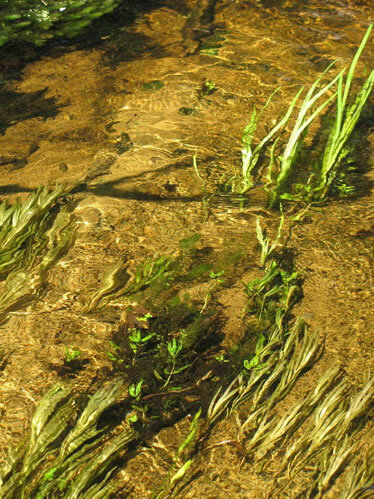 They appear in spring. 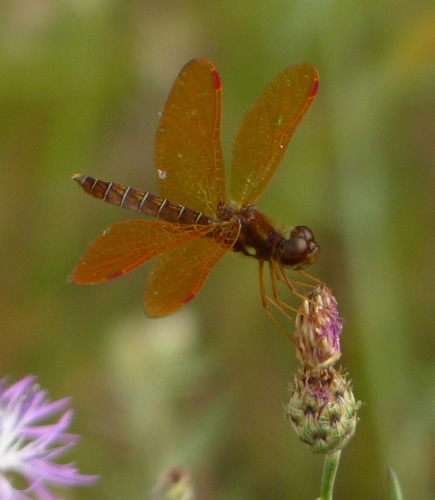 Comments: This individual lacks the orange spots usually seen at the base of the “tails” extending rearward from the hind wings. 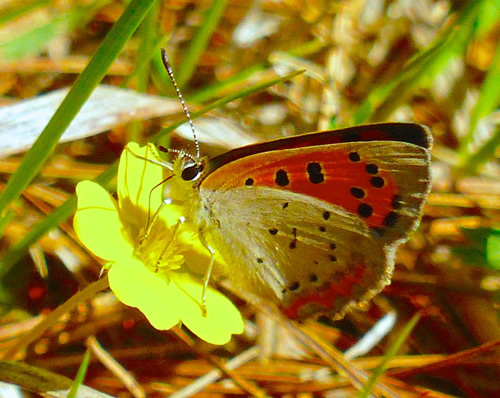 Comments: This beautiful little butterfly can be found in open fields from May to October. 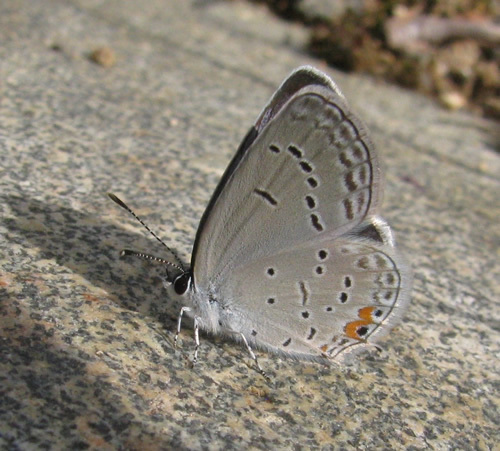 When it spreads its wings, the blue upper sides show how this butterfly gets its name. 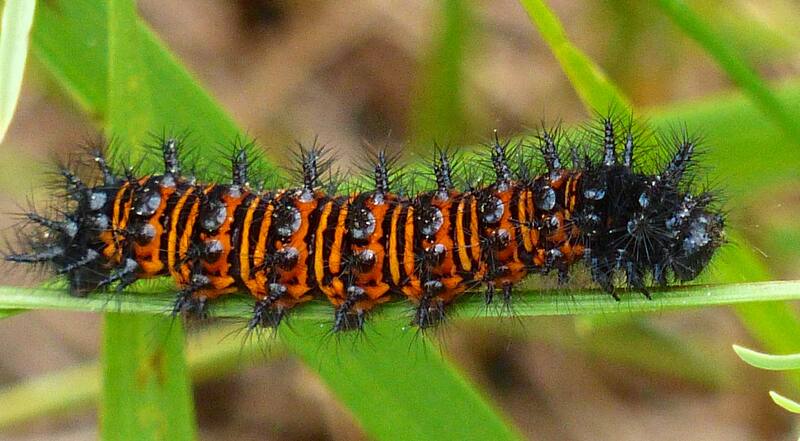 Comments: This pest has spectacular coloration. 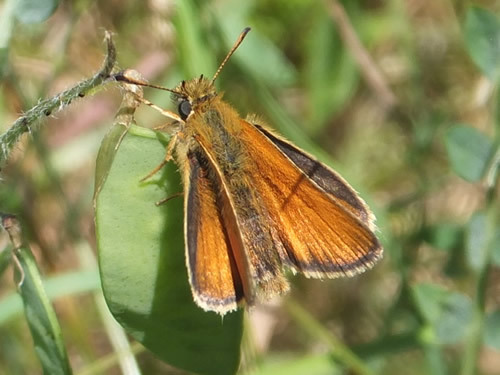 Comments: There are hundreds of these non-native butterflies in the Hayfield at this time of year. 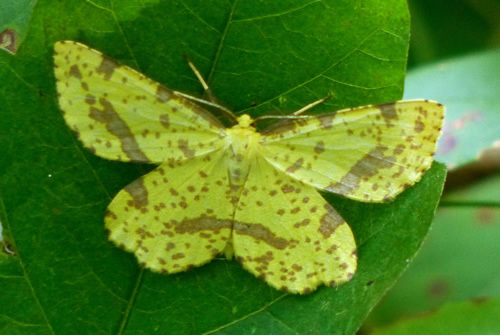 Comments: I was surprised to see this striking yellow moth in my backyard during the day, as most moths are nocturnal. 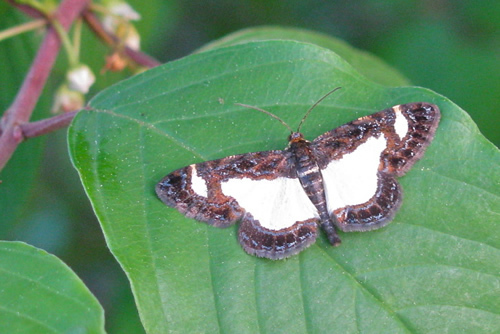 Typically moths have longer, larger and more elaborate antennae than butterflies. 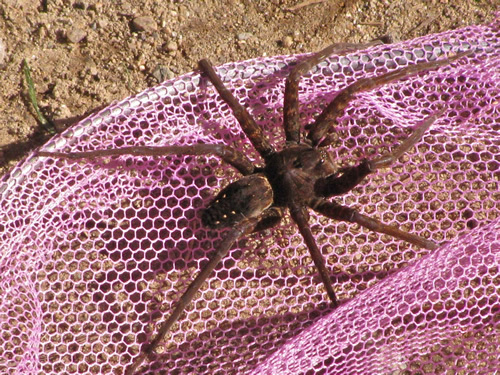 Comments: This huge spider (about 3″) was spotted in aquatic vegetation near the stone hut at the edge of Lower Leach Pond at Borderland State Park. 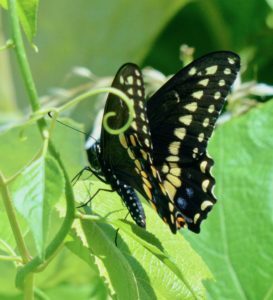 A boy with a butterfly net scooped it up so I could get a photo of it. I got the identification from www.bugguide.net. 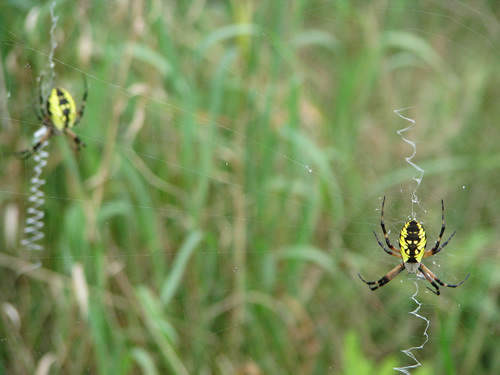 The three pairs of yellow spots on the rear abdomen help identify this species. 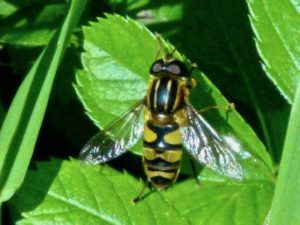 Comments: Flower Flies (also known as “hover flies” because of their tendency to hover in mid-air for long periods), are especially interesting insects. They are overlooked by nearly everybody but farmers, who recognize them as one of the most important groups of insects beneficial to humans. 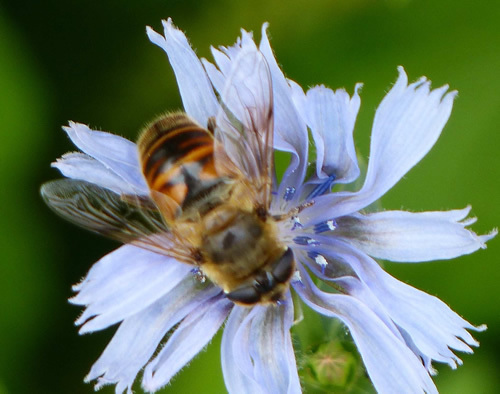 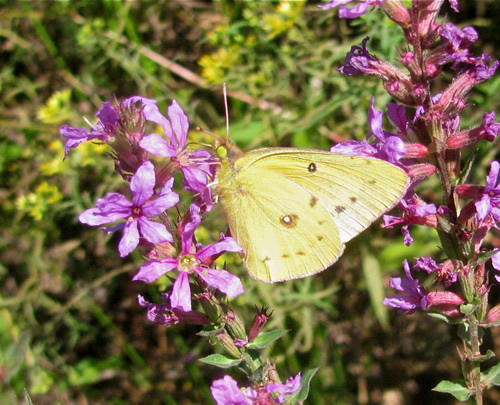 They’re not only important pollinators, but they dispose of crop pests as carnivorous larvae. 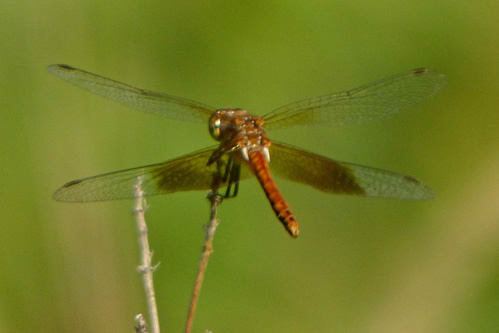 There are 15 genera in all, and hundreds of species.